wow, this weekend was an unbelievable whirlwind! i've mentioned before that we are lucky to have a local theatre that pulls in many national broadway show tours throughout the year. ryan works almost all of them through our theatre stage hands union, and lately i've been working them too. 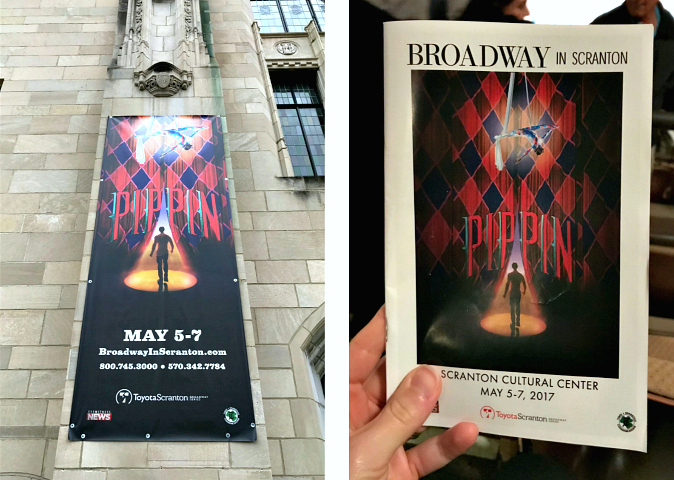 this weekend the national tour of pippin was in town. we both worked the load in and the load out, and ryan worked the run of the show too. the company that orchestrates the logistics of the tours that come through our area has an educational committee that has been running several educational theatre outreach programs lately. for this show, they arranged for two of the dancers from pippin to teach a fosse-style dance workshop. i was thrilled that my dance studio was able to partake! 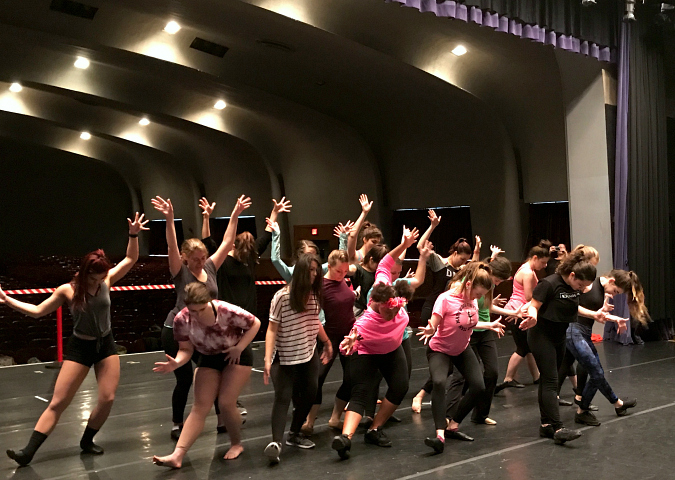 on saturday morning, we all gathered at a local university with dancers from other local studios for the workshop. 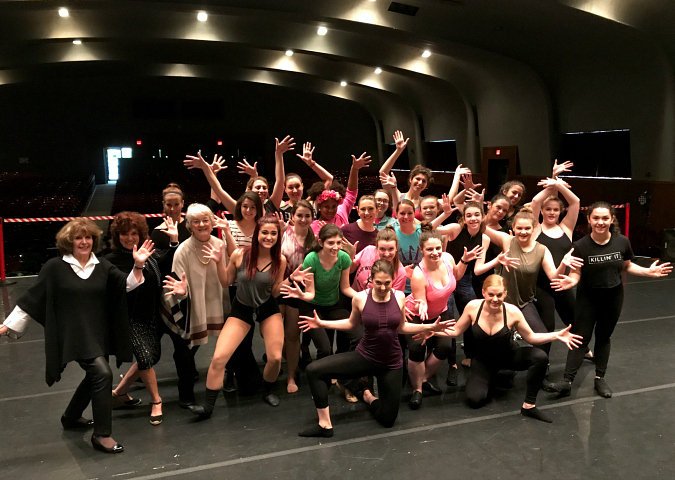 we had a little fosse boot-camp and then learned the choreography for all of "magic to do" which is the opening number of pippin. 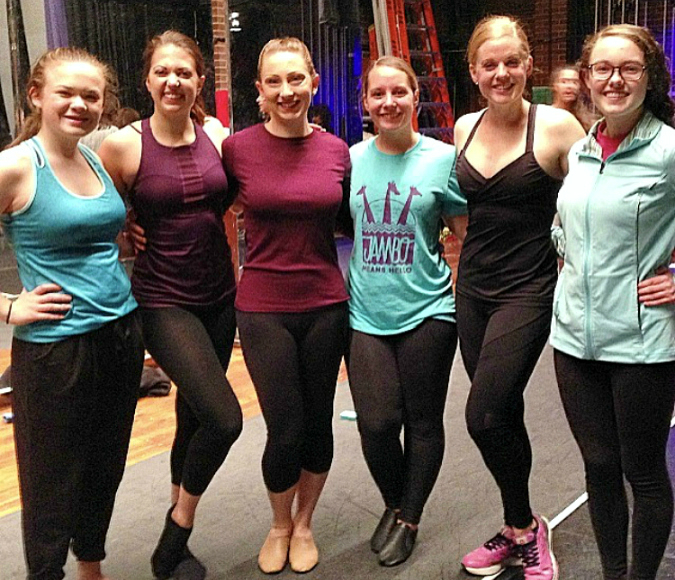 it was so much fun, and it was great to meet and learn from two of the show's professional dancers. once the workshop was over in the afternoon, we headed to the theatre venue where the show was being performed in order to see the matinee performance. the show was excellent and we absolutely loved it! (i especially enjoy getting to see the shows that we work with the union because it is so neat to see how everything we set up is used throughout the show.) after the show was over, several of the cast members took time before their evening performance to do a meet-and-greet / question-and-answer session with our studio's dancers who participated in the workshop. working the show and doing the workshop made for an exhausting weekend, but it was well worth it. we didn't get many pictures from saturday, but we did get a few phone snapshots . . .
What a great opportunity and such fun. That was a great opportunity for you and for the girls. Such fun!